NASA has measured in 3D how much dust is transported from Africa and how much phosphorous it contains. Phosphorous is an important plant nutrient, though the low supply of it in the Amazon means it has to come from another source. 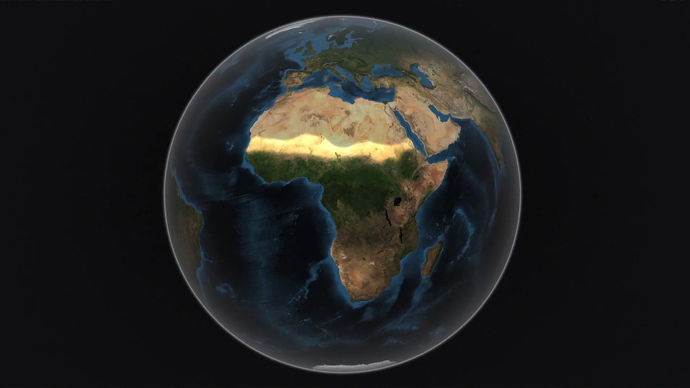 That source, it turns out, is Africa, where the phosphorus originates from an ancient lake bed in the Bodele Depression in Chad, which itself is made up of dead microorganisms loaded with phosphorous. "We know that dust is very important in many ways. It is an essential component of the Earth system. Dust will affect climate and, at the same time, climate change will affect dust," Hongbin Yu, an atmospheric scientist at the University of Maryland and the lead author of the NASA study, said in a statement. “To understand what those effects may be, first we have to try to answer two basic questions. How much dust is transported? And what is the relationship between the amount of dust transport and climate indicators?" NASA’s Cloud-Aerosol Lidar and Infrared Pathfinder Satellite Observation satellite, or CALIPSO, collects “curtains” of data showing the altitude of dust layers in the atmosphere. This information tells scientists the height the dust travels at, where it will go, and how it will interact with the Earth’s heat balance and clouds – not only now, but also in future climate scenarios. The satellite study, which collected data from 2007 through 2013, revealed the Sahara dust storms measure 182 million tons, or the equivalent of 689,290 semi-trucks. Researchers found the storms travel 1,600 miles across the Atlantic Ocean and drop around 27 million tons of dust on the Amazon forest, all of which contains 22,000 tons of phosphorous. This is about the same amount of phosphorous that is lost annually in the Amazon from rain and flooding, Yu said. About 43 million tons of dust travel farther to settle over the Caribbean Sea. The finding is part of a bigger research effort to understand the role of dust and aerosols in the environment, and on local and global climate. Yu’s paper was published Feb. 24 in Geophysical Research Letters, a journal of the American Geophysical Union. A paper published online by Yu and colleagues Jan. 8, called 'Remote Sensing of the Environment,' provided the first multi-year satellite estimate of overall dust transfer from the Sahara to the Amazon. Looking at the data year-by-year shows that that the amount of dust transferred to the Amazon is actually highly variable. Yu said there was an 86 percent change between the highest amount of dust transported in 2007 and the lowest in 2011. Scientists believe this has to do with conditions in the Sahel, the long strip of semi-arid land on the southern border of the Sahara. After comparing the changes in dust transport to a variety of climate factors, the one Yu and his colleagues found a correlation to was the previous year's Sahel rainfall. When Sahel rainfall increased, the next year's dust transport was lower.